Product #15731 | SKU LS-CS40MK | 0.0 (no ratings yet) Thanks for your rating! 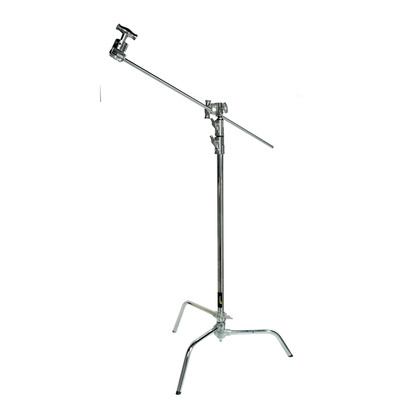 This Impact 40" C Stand with Sliding Leg Kit - 11' (Chrome) is comprised of a C Stand with a unique base with one leg that slides up and down the riser to accommodate uneven terrain. The individual legs positioned at any angle in locations not possible with standard design stands. The included 40 inch extension grip arm fits neatly into the stand's removable 2.5" grip head allowing you to offset the stand and cantilever flags, gobos or lights out of the way of the action. This stand features a leg that slides up and down the riser to accommodate uneven terrain or stairs. The legs fold flat for storage.